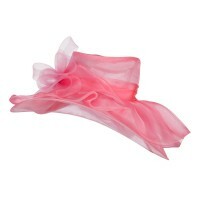 Fancy organza hats are made from organza that looks like a flimsy material but is very durable. While they are popularly worn on special events like weddings and charity parties, you can wear Bucket and Dressy hats even on casual and ordinary days. Garden parties and other dressy events call for the perfect elegant head accessory–one that will drape effortlessly over the head while adding a touch of sophistication. Fancy Organza Hats and Fascinator Hats do just this. These hats are especially dainty as they contain organza, a soft, light fabric; these hats also have other adornments which are also made of airy material, such as lace and feather. 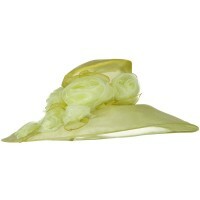 Fancy Organza Hats also often possess ruffled trim; this unique feature adds a fun, feminine touch to the piece. 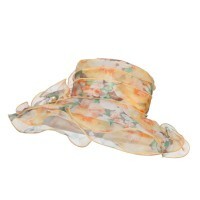 Fancy Organza Hats are perfect to wear in the spring as its delicate material–and floral print, if one acquires this dressy hat in that pattern–reminds one of soft, blooming flowers, and in the summer as its lightweight fabric and wide brim keep the wearer cool and shaded from bright sunlight. 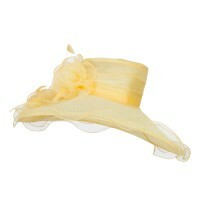 Pair this special hat with a dressy ensemble or even throw it on to dress up a simple, casual outfit. Looking for a Fancy Hat? Then we got you covered. We have a huge line of Sinamay Hats that you can choose from Organza Hats are very fancy but unlike other hats, they can also be worn on casual days making them dual purpose hats. Wear them all year round but they work well during the spring and summer months because of their colorful motifs. In fact, they are best worn in spring and summer as they provide enough protection while allowing air to circulate around your head. Another hat that you can get that is as fancy as organza hats are Wide Brim Hats. These hats do not only provide you with enough protection against the sun during hot summer days but they also provide a strong fashion statement who wants to look good outdoors. Wear these hats in the beach or just while reading a book in the park. If it is simplicity yet classic elegance you are looking for, Cloche Hats are perfect for you. They are very iconic and classic hats that can complement whatever fashion style you may have. Wear them with jeans, coat, or with a sundress and you are good to go.